Montgomery residents are actively engaged in their community and keeping them informed is our top-priority. 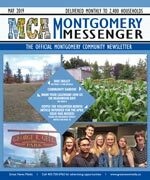 Montgomery Messenger is the official community newsletter, and covers community news and is published monthly to keep content current and relevant. Delivered to every household, apartment, and business, every resident is acquainted with the community’s most important information. The Montgomery Community Association is a dedicated group of volunteers that lead the MCA Board, Champion community safety, foster community pride, steward the community’s vision for future development, and communicate important issues to all its residents. The Montgomery Community Association puts on a number of programs, activities and events for residents of all ages. The MCA is always looking for volunteers to help out so make sure you get involved and make this community yours. Residents in this community had a median household income of $42,795 in 2000, and there were 24.7% low income residents living in the neighbourhood. As of 2000, 18.7% of the residents were immigrants. A proportion of 11.4% of the buildings were condominiums or apartments, and 32.8% of the housing was used for renting. For more detailed info visit the City of Calgary community profiles.